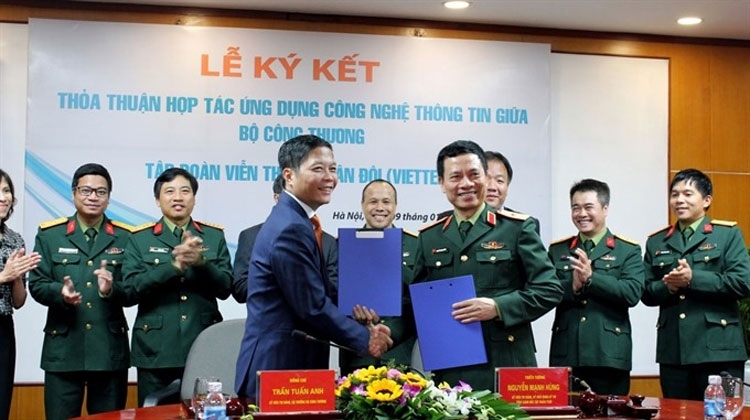 The Ministry of Trade and Industry (MoIT) and military-owned telecom company Viettel Group on Monday signed a cooperation agreement on applying information technology (IT) to build e-governance and e-commerce infrastructure. Under the agreement, from this year to 2020, Viettel will develop a programme to modernise the ministry’s management and supervision activities, and install IT infrastructure for online public services, policy-making processes, law enforcement and e-payment transactions. At the signing ceremony, Minister of Trade and Industry Tran Tuan Anh talked about the significance of information technology in digitalising the State management. It is particularly important to support the ministry in streamlining administrative procedures and providing online public services, Anh said. Viettel General Director Nguyen Manh Hung said the solutions provided by the group would not only help create a smart, efficient and speedy management system for the ministry but also facilitate the development of e-economy for people and businesses. The agreement will also open opportunities for partners and small- and medium-sized enterprises to get support from the programme, which will help them improve their capacity and competitiveness in the context of deeper global economic integration, Hung said. Last year, the Government assigned Viettel to build important national-level systems, including a database of inhabitants for the public security ministry; a birth, marriage and death records management system for the justice ministry, and a National Single Window for the finance ministry.